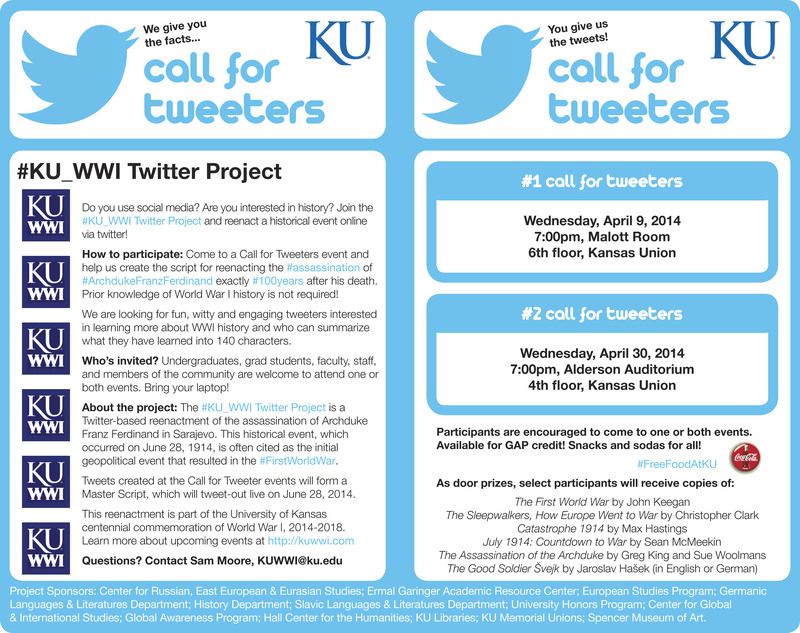 The #KU_WWI Twitter Project’s first Call for Tweeters will be this Wednesday (April 9th) at 7pm in the Malott Room of the Kansas Union (6th Floor). Students, faculty, and members of the KU community are welcome to come! The general idea is to have KU students, faculty and staff create a script for reenacting the assassination of the archduke which will tweet-out live on June 28, 2014, 100 years after the event. You don’t need a twitter account, and you don’t necessarily need any knowledge of WWI or the assassination of Archduke Franz Ferdinand. All you need is creativity and the ability to summarize what you learn into 140 character tweets!